Death of a parent is a life-changing experience. However, through our grief, we often have a closer encounter with our Lord Jesus Christ. 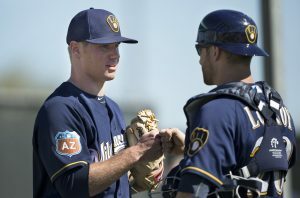 Chase Anderson, a starting pitcher for the Milwaukee Brewers, had one such spiritual experience. Chase grew up in Wichita Falls, Texas. His father went to the United Methodist Church growing up; and when he was young, Chase often went with his grandmother there. Later, as he got older, he would also attend the Colonial Baptist Church. Chase went to S.H. Rider High School in Wichita Falls, and he became friends with Anna Cameron, who was a year and a half older than he. 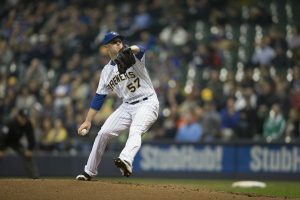 Chase Anderson, starting pitcher on Saturday April 23rd, 2016 at Miller Park in Milwaukee. They grew up a short distance from each other, having the huge high school building physically between them, but they did not know each other until high school. At Rider High School Chase played baseball for the Raiders; and as a senior, he pitched three no-hitters. Upon graduating from high school in 2006, he was drafted in the 42nd round by the Minnesota Twins. He did not sign, and he chose to attend North Central Texas College, a junior college in Gainesville, Texas. He was again drafted by the Twins in 2007 in the 40th round. Chase again decided not to sign. He would attend the University of Oklahoma where he played baseball for two years. Chase was drafted in 2009 by the Arizona Diamondbacks in the ninth round, and he signed. He began his journey through the D-Backs minor league system. In 2011, Chase met up again with Anna, and they renewed the friendship. Chase hoped he could get to know her better. In 2012, while Chase was in the minor leagues, he would come to realize how important that friendship really was. During this time of loss, his friend, Anna, was there for Chase. Anna was a huge help providing comfort and understanding during a tough time in his life. Soon after, their relationship changed from friendship to romance. After the Fall Baseball League and as Christmas rolled around, Chase took Anna on a carriage ride and asked her to marry him. He became a part of another awesome family in Anna’s wonderful family. The following November 16, 2013, they were married. Three years later now, they are expecting their first child in November, 2016. Their off-season home is in McKinney, Texas, and they attend the Village Church in Plano. Chase was in AA in 2012; and in 2013, he was in AAA but pitched poorly. 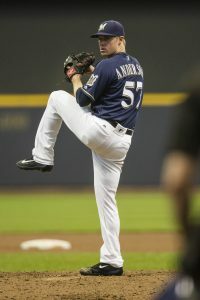 Then in 2014, he started in AA where he met up with Green for six starts, but he was moved up to the big leagues with the Arizona Diamondbacks. Chase got his major league debut May 11, 2014. Previous post: What Does A Freewill Offering Mean?